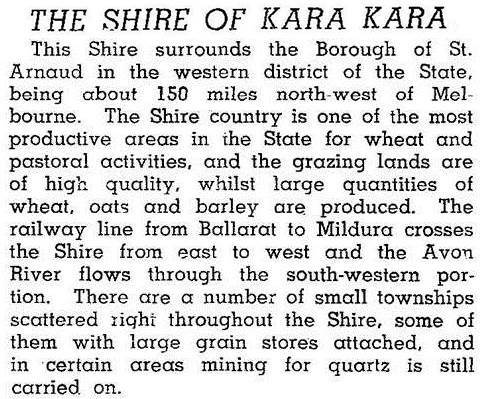 Kara Kara Shire (1884-1995) was situated around the town of St Arnaud in the Wimmera region. St Arnaud was a separate municipality, but contained Kara Kara Shire’s offices. The shire originated as St Arnaud shire on 14 November 1864, occupying an area extending as far afield as Warracknabeal, Hopetoun, Wycheproof and Charlton. Those areas were severed as separate shires between 1864 and 1895, in the course of which Kara Kara shire was severed on 20 October 1884. Its area was 2293 sq km. The shire began with a population of nearly 5000 people, but the decline of mining and the amalgamation of farm properties resulted in a population loss of about 75% over the following 100 years. The name Kara Kara is thought to have been derived from an Aboriginal expression describing gold and quartz. Pastoral agricultural activity in 1994 occupied 79% of the area of the shire and St Arnaud town. There were 339,000 sheep and lambs, 21,700 pigs and harvests of 45,842 tonnes of wheat and 17,582 tonnes of barley. Despite these figures the shire maintained quite a grand hall in Napier Street, St Arnaud, a National Estate conservation area. On 20 January 1995, Kara Kara shire was united with Stawell shire, St Arnaud town, Stawell town and parts of Wimmera and Dunmunkle shires to form Northern Grampians shire.